Thomas Heatherwick has defended his Garden Bridge proposal for London's River Thames, after a BBC report found that the project was missing £22 million in funding. Heatherwick appeared on last night's BBC Newsnight TV programme, which centred around an investigation into the funding of the project. He said the bridge had become a political football, and that to scrap it now would indicate that the UK had lost confidence in itself. "Money has been spent to get this far," said Heatherwick. "It is ready to go, and it is important that our society doesn't show that we suddenly have no confidence in ourselves... that we don't suddenly seem like, 'Yep, we've had a political turmoil, now we suddenly close up and we're just going to go backwards.'" "There's all sorts of people who want to get their little agenda [through]," he added. "How can it possibly be a bad thing to stitch the city together better, to create new public space that we have never had before, new views for all of us." The 367-metre-long planted bridge is planned to span between South Bank and Temple and was originally expected to cost £175 million – with £60 million in government funding and the remainder raised by the Garden Bridge Trust through private donations. But Newsnight's investigation found that a number of investors had pulled out over the past year, leaving the trust with a much bigger shortfall than previous estimates of £30 million. The programme said that the trust was missing an additional £22 million. Chair of the trust Mervyn Davies, who is also head of private equity company Corsair Capital, said that delays had further increased the cost of the project by £10 million, taking the shortfall to £62 million and the total cost to £185 million. The National Audit Office has now also launched an official investigation in the Department of Transport's handling of its £30 million grant to the Garden Bridge Trust. In July, new transport secretary Christopher Grayling demanded a dossier of financial data on the project, following a request from the trust for the government to extend its underwriting of an initial £15 million in funding – meaning that the trust's bills would be covered even if the project did not go ahead. Grayling has yet to make a final decision. The bridge was due to open in 2018, but the trust has now moved this back to 2019. Davies told the BBC he was still confident that the project would go ahead. "This is an iconic project," he said. "It does sum up what's great about Britain." "This project is majority privately funded so this unique London landmark will be delivered with great value to the taxpayer," said the trust in a statement sent to Dezeen. "We have faced considerable challenges but we are now on the brink of building a truly unique crossing," it added. "It would be a tragedy if the government withdrew their support now." "We are not asking for more public money but we do need the government's renewed backing." The Garden Bridge is the brainchild of Heatherwick and actress Joanna Lumley, and will feature full-size trees and planted sections along its deck, with a "super-strength" copper-nickel skin covering the structure's underside and legs. But it has been mired in controversy since it was first proposed in 2012. 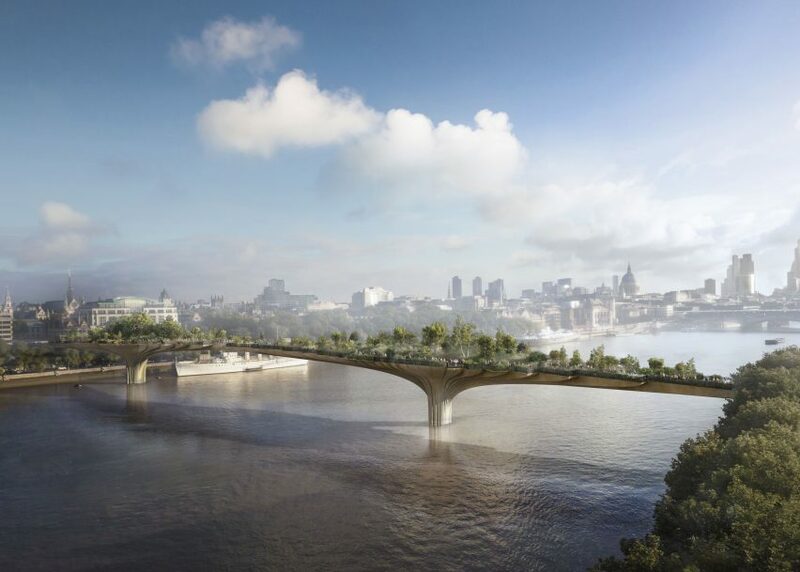 Questions have been raised over the procurement process for the design of the bridge, with some believing that Heatherwick was given an unfair advantage over other firms that bid on the project. According to the BBC, Transport for London – the government body responsible for public transport projects in London – has said that the procurement process was not as fair as it should have been. A contractor was appointed in March. But preliminary construction work was suspended last month by London mayor Sadiq Khan. His predecessor, Boris Johnson, was one of the most vocal supporters of the project. Khan has pledged that no more public money will be spent on it, but has also said it would cost more to cancel it completely than to go ahead. Access to the bridge has also caused issues, with campaigners protesting against lack of bicycle access and the fact that the structure will be closed to the public at night and for 12 days each year. A judicial review was granted in 2015, despite the project receiving planning consent from both Lambeth and Westminster borough councils. Alternative green crossings have been proposed by architects Allies and Morrison, and Crispin Wride for nearby Blackfriars Bridge, along with a variety of more satirical suggestions. Heatherwick has a similar project in New York – the Pier 55 elevated park over the Hudson River, which has begun construction after overcoming a legal battle earlier this year.